ERR_CONNECTION_CLOSED is one common error, we all, at some point in our life have encountered with. This type of issue occurs when the server of the website that you asked data from declines your request. In simpler words, the server you are trying to connect to is putting you out of the line and not giving data required for you to visit that website. Other forms in which ERR_CONNECTION_CLOSED can be shown are- This Web page is not available, This webs page at www.webname.com might be temporarily down or it may have moved permanently to a new address and so on. It will be much helpful if you know what the reason for this error could be. But even if you do not have any idea of that, the methods given below are easy in a way that you can perform most of them in no time and solve the error. How to fix ERR Connection Closed Error? 1 How to fix ERR Connection Closed Error? A number of reasons could be responsible for ERR_CONNECTION_CLOSED error. Some of which are – no response from DNS Server, Poor DNS settings in Windows, old Cache, Data, and DNS Cache, etc. To fix this issue, you can try out any of the following methods. This method comes easy and a quick fix for most of the times. It will hardly take two minutes of yours to fix your ERR Connection Closed error. Enter chrome://flags/ in the Chrome Address Bar. Then hit the Enter Button. A page will appear on the screen with the Settings in the browser Google Chrome. On the Right of the page, you will see an option to Reset all to default. Select it and then Restart the browser. If the above method didn’t work out for you, try the one below. But before starting, note that all the data saved in your Google Chrome will be then deleted. This includes- Saved Passwords, Browsing History, Autofill forms, etc. Paste this link in a new tab and then hit enter. A box asking what to clear will appear on the screen. Choose all options and then press Clear Browsing Data. Many times the reason for ERR_CONNECTION_CLOSED could be no response from the DNS Server that your computer automatically receives. Changing the DNS Server address to servers similar to Open DNS or Google can solve your problem. On the Windows logo, right click and choose the Network Connections Option. Now Right-click on the Active Network. i.e., the internet connection you are right no using and choose the option of properties. In the options list, select Internet Protocol Version 4 and press the Properties button on the bottom right. When a new Window appears, check the preferred DNS address and alternate DNS address from below and enter given DNS Settings in it. Now click on OK to save made settings. Click Windows Key+ R and then type inetcpl.cpl and select enter so as to open the Internet Properties. Go to Connections and choose LAN Settings. Now uncheck Use a Proxy erver for your LAN and check Automatically Detect Settings. At last, Click OK and Apply and then Restart the PC. 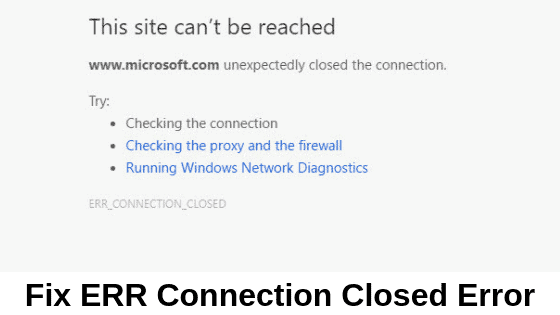 One reason for the ERR_CONNECTION_CLOSED could be a misconfiguration of Network Settings or DNS Settings. However, there is nothing as such to worry about since you can easily with the help of a few commands reset Network Settings and flush the DNS as well. Press the Windows button. Search cmd and a command prompt search result will appear on the screen. Then Right click on the same and Choose the option to Run as Administrator. When the command prompt appears, enter the following lines. You can also copy the commands given below and then paste it in the command prompts. Once you enter them all, hit the enter option. When you are done running all the listed commands, all you have to do is restart Windows or PC. I assume you all found the article of use. In case you are still stuck at any of the above methods or have any doubts, you can let us know in the comment section below. Keep visiting our page for more such stuff or you can also subscribe to our newsletter to receive timely notifications of our posts. I hope the fixes above was somewhat helpful and resolved the issue with the connection closed error. If it still doesn t then please comment below with the details of the fixes that you have applied and I will try my best to help you further.